The heart locket is a very ingenious and beautiful origami model created by Gay Merrill Gross. 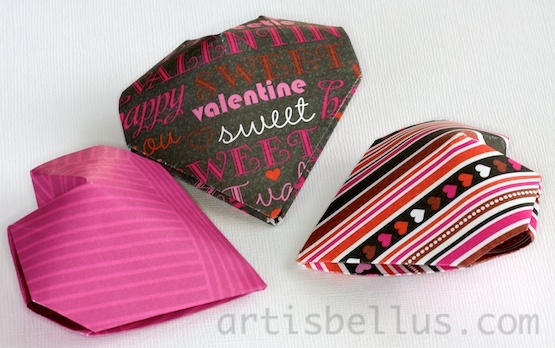 You can put a note, a candy or, even a small object inside it, and give it away as a Valentine's Day present. The instructions to fold the heart locket can be found in the book Origami: Easy-to-Make Paper Creations , by Gay Merrill Gross. I folded the ones in the picture with 6" (150 mm) squares of scrapbook paper. It does not take much time to fold a bunch, so they can also be given as treats in a party. I saw the heart locket in a second hand book I bought last year. The title is The art of origami, by Gay Merrill Gross, published in 1993. I tried to fold the model, mine will not stay closed, it pops open. Annemieke, I think that the folds in the inside triangular flaps (shown in step 23, cutaway view) help to keep the model closed, so those folds need to be very sharp. It will also help folding it with a paper a little bit thicker than regular origami paper, like scrapbook paper or copy paper.